Welcome to our new website! Make yourself comfortable and stay a while. 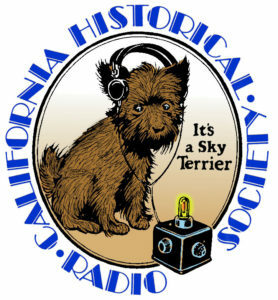 Starting last month, the California Historical Radio Society embarked on an exciting project to organize, digitize, and make available thousands of documents with which we had been entrusted by Society of Wireless Pioneers (SoWP), an organization of veteran professional radiomen and radiowomen that was founded in Santa Rosa, California some 50 years ago. Their membership spanned the U.S. and the world. 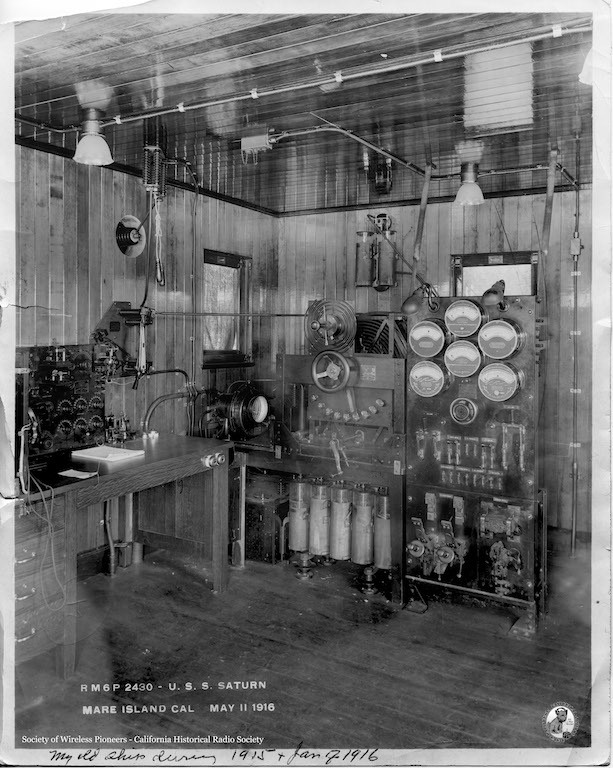 The photo below, showing the radio room of the U.S.S. 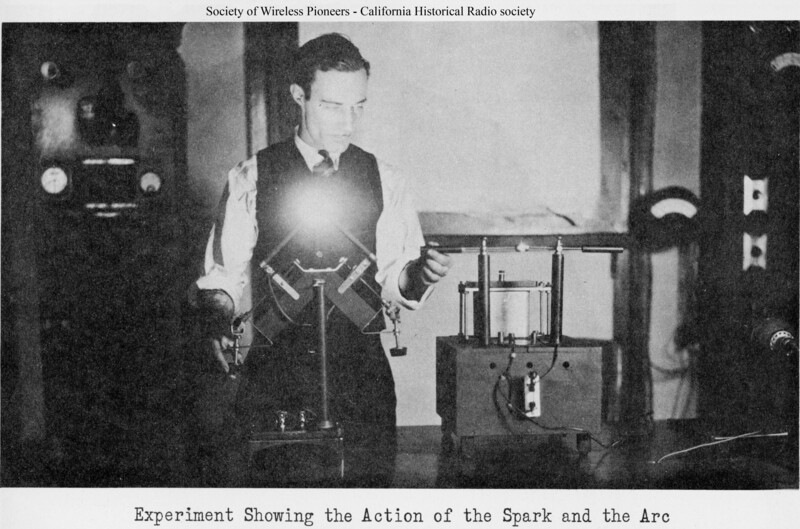 Saturn in May of 1916, shows the type of technology that many SoWP members knew and loved. Handwriting at the bottom is by the late Corwin R Henry, K6DX, and this came to our archives by way of the San Francisco State University Professor Hal Layer’s personal collection. Quite a few SoWP members harkened back to the days of spark and arc. From the look of it, most were ship radio operators (called “Sparks” in their day), but others worked on dry land or from planes in the air. Many were in the U.S. Navy in WWII, some even in WWI. Most are now SKs (silent keys). But what an inheritance they left us! We have about 40 boxes overflowing with photos, memorabilia, obscure old magazines, cartoons about radio, schematics for radios not previously known to exist, letters (some funny, some heartbreaking), diaries and reminiscences, radio catalogs, ancient sales brochures, etc., etc. Last week I found an unusually heavy envelope in one of the boxes. It turned out to contain the brass name plate from a 2 kW Marconi P-8 spark transmitter that had been installed in the radio room of the H.R. Mallory, a ship in the Clyde-Mallory Line, in September of 1916. 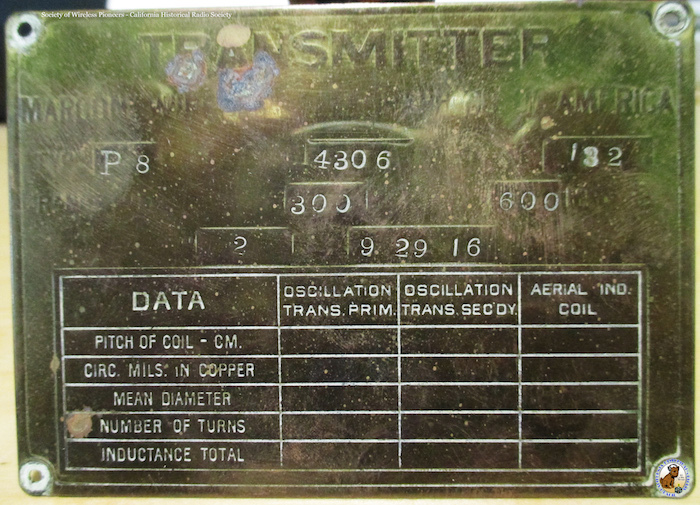 Brass name plate of Marconi P-8 2 kW spark transmitter on SS Mallory. The transmitter it was attached to was only removed in 1939, just a few years before the Mallory was torpedoed and sunk by a U-boat in the North Atlantic. More than half the people onboard were killed, including two Radiomen, a Radio Operator, and the Radio Officer. A couple of weeks ago I ran across some old magazines that appear to have belonged to (and were marked up by) Dr. Lee DeForest himself. 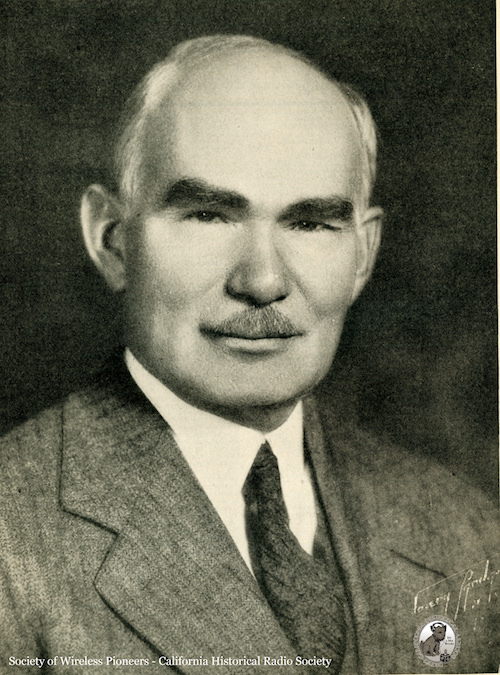 Dr. Lee DeForest, inventor of the triode. 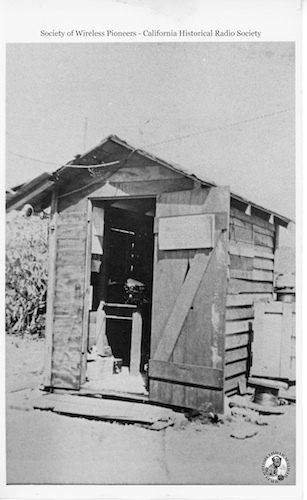 Another interesting item was a 5 x 7 photograph of a primitive-looking shack not much bigger than an outhouse. This turns out to be the first Pan Am radio station on Wake Island, KNBI, in 1935. Now there’s an outside chance it might turn up on TV, in an American Experience episode, “Across the Pacific” due to air on PBS next year. You just never know what you’ll find in the SoWP archives! Pan Am station KNBI in 1935, the first radio shack on Wake Island. In coming weeks, months, and probably years under the direction of our Historian and Archivist, Bart Lee, K6VK, we’ll be cataloging, scanning, and uploading as many as possible of these treasures to the web. Our intent is to make these available and easy for anyone to download and examine. At this early stage we’re still working out the process, but we’ll keep you informed on what we find and where you can find it, in part via this blog.